I was invited to a press breakfast at the International Beauty Show hosted by SHE by SO.CAP, a hair extension company. I loved learning about this company and their commitment to working with the American Cancer Society and patients that are dealing with hair loss due to cancer treatment. Prior to visiting the beauty show, I had no experience with hair extensions. I was impressed with all the options that SHE by SO.CAP offers (like 91 hair color options(!!!) with 3 different textures – curly, straight and wavy), as well as how natural and beautiful the extensions are. They work well on all hair colors and types, so you can go subtle and use extensions that match or complement your hair color, or you can go with a fantasy color shade for a pop of color. The company developed a cold fusion technique which allows the keratin pre-bonded extensions to be safely applied close to the scalp. They do not damage the hair, are easy to maintain and keep clean, are made from natural, human hair, and can help you achieve your ultimate hair look. I received some SHE by SO.CAP sample clip-in hair extensions to try and I was pleasantly surprised with how easy they were to wear and how soft the hair was. It blended nicely with my hair and gave me more volume. I also tried clip-in bling and feather extensions and these were so fun and added some flair to my hair when I wanted to stand out and make a statement. I think extensions are a wonderful way to experiment with your hair without doing anything damaging or permanent. 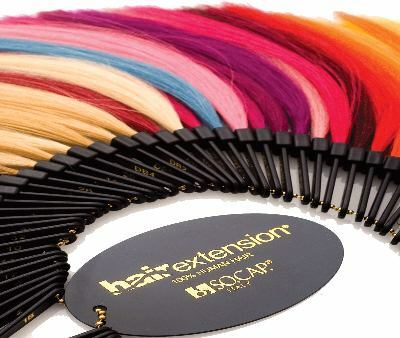 Whether you are looking for bonded extensions to create your ultimate hair look, or looking for a quick hairstyle change for an event or occasion, SHE by SO.CAP has extensions for you. They offer keratin-bonded, clip-in full head of hair, clip-in ponytails, clip-in fringe, and clip-in feather and bling extensions. They also offer a full hair care line to keep your hair and extensions looking their best. If you’ve ever wondered about getting hair extensions for yourself, check out SHE by SO.CAP. It’s offered at over 10,000 salons nationwide and you can visit their website or call 1-877-855-4247 to locate a salon near you! Let SHE by SO.CAP help you achieve your dream hair!